THANK YOU FOR A TOP CLASS SHOW AND FOR THE CLOSE-UP MAGIC AT OUR COMPANY PARTY! YOUR PERFORMANCE WAS A PERFECT MIX OF MAGIC AND SITUATIONAL COMEDY. The Marcus Alexander Show is aimed at adults and is a combination of marvelous magic, hilarious humor and exceptional excitement! Marcus Alexander is an entertainer in high demand at both small and big corporate events – his show is immersive and will relax the atmosphere in one fell swoop. This magical performance entertains, amuses and amazes! When it comes to customer events or public events it is important the entertainer fits the image of your brand and raises the stature of your event. An entertaining show designed for corporate events lightens the mood and will not be forgotten. To ensure the glow of your event to last for years, get in touch with magician Marcus Alexander! The duration of the show is 15 minutes or can be customised. For events with fewer than 500 people a battery-powered speaker system can be provided. Close-up magic is magic performed right in front of the audience. It will mess with your brain and blow your mind! This is visual entertainment even the most skeptical engineers can’t comprehend. Close-up magic is well suited at the tables between courses. An individual mini show at each table will enhance the atmosphere, and together with the incredible magic and personal approach, Marcus Alexander will make your event a memorable one. Winning first prize at the Finnish Restaurant Magic competition, The Marcus Alexander show is sure to impress. The pictures on your business cards will disappear, playing cards will change their colour and money will appear out of nowhere! When you want to experience some true magic in a small group (less than 50 people), the Marcus Alexander close-up show is the way to go! Whether it is a classy gala dinner, a customer meeting or a sauna evening for the staff, a combination of a show and close-up magic works for sure. This captivating show engages the audience and relaxes the atmosphere, while close-up magic elevates the mood and will give something to talk about for hours. Marcus Alexander,AKA Markus Hyytiä, got on the stage for the first time when he was 10-years old and since then he has performed in countless corporate events and private parties. 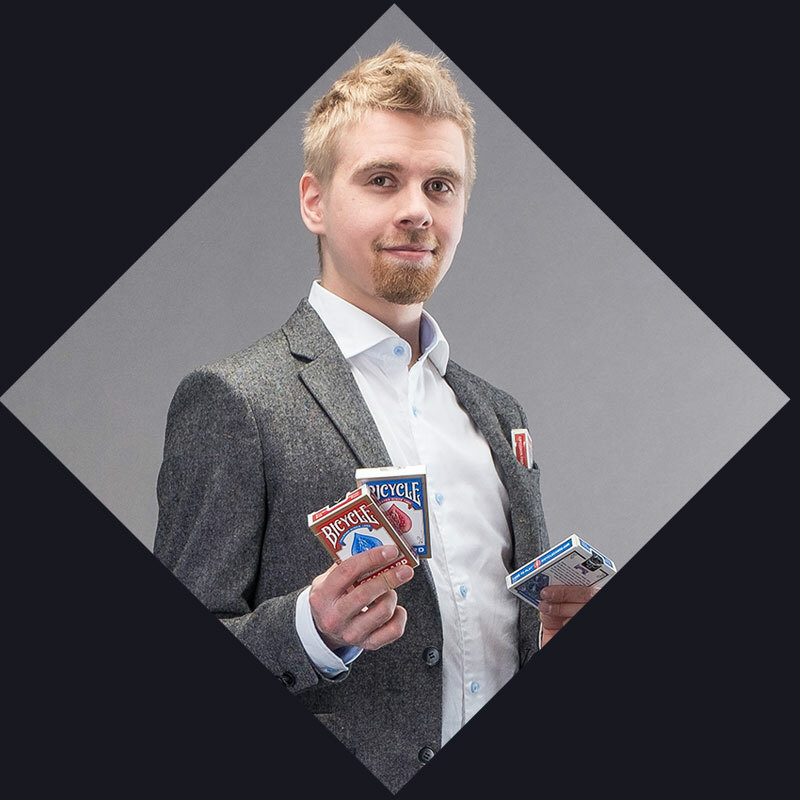 Since 2010 Marcus has been practising magic full-time and his show has been seen by tens of thousands of people across Finland. Achieving top places in magic competitions speak for both the diversity of the performer and his appreciation among fellow magicians. THANK YOU FOR YOUR PROFESSIONAL AND HUMOROUS PERFORMANCE, WHICH WAS MAGICALLY WELL SUITED FOR A FUN NIGHT AMONGST A GROUP OF ADULTS. THE PRESENCE AND PARTICIPATION OF THE AUDIENCE WAS TANGIBLE. MAGICIAN MARCUS ALEXANDER HAS THE ABILITY TO CREATE AN ENTERTAINING AND A SPECIAL MAGIC SHOW COMBINING HUMOUR AND MAGIC TRICKS. ADD TO THIS A TOUCH OF CLOSE-UP MAGIC AND YOUR EVENT WILL BE TRULY MEMORABLE. Book now or get in touch with Marcus! © 2019 Taikuri Marcus Alexander.